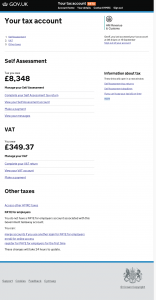 We've recently started fact-checking the prototype digital tax account for businesses. This process makes sure that the information that we will present to users of the service is technically accurate. Our colleagues in GDS have previously blogged about how fact-checking fits into the development process for GOV.UK, and it's a similar story here. Up until now, we've been focusing on making sure that customers can easily find their way around our service and understand what we're asking them to do. Now we need to check that in making the service easy to use, we haven't accidentally asked customers to do the wrong thing or given them misleading information. We'll continue to work on making it easier for customers to use our service, but it feels like an appropriate time to reflect on what we've done so far and what the service looks like at present. Since we started beta work, we've been testing our service with customers to find out whether it works for them. We do this on a regular basis, which helps us rapidly to improve the service. We can try different ways of presenting content and quickly identify what is most helpful. To illustrate this, I'm going to show you some changes we've made to the homepage over the summer. Here's a screenshot of the homepage taken in August. We still wanted to make it clear what customers need to do next, so we experimented with different ways of highlighting this information. The screenshot above shows how we tried to highlight the next action that the customer needs to take by using green boxes. Unfortunately, this confused some customers, because we couldn't always predict what action they would want to take next. 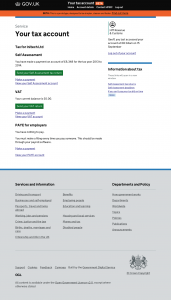 We also discovered that customers were getting confused because sometimes when they first arrived at the homepage they couldn't see all of the taxes for which they were registered. This happened because we were showing a lot of information, which didn't always fit onscreen. We needed to make clear up front which taxes people could interact with, and reduce the amount of information we were displaying. 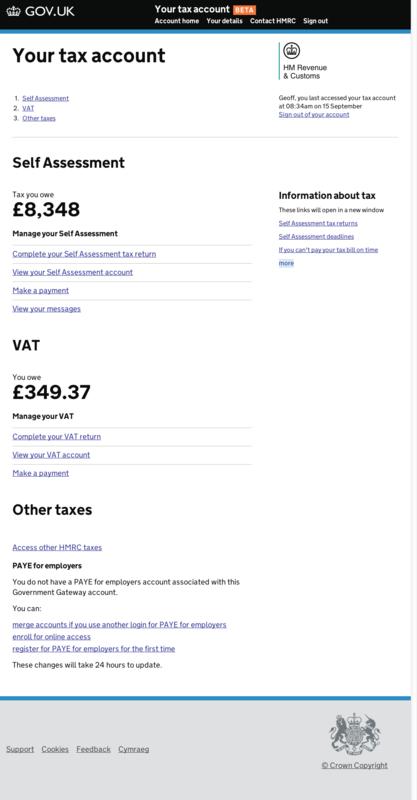 This shows how we've made clear which taxes they can manage from the account, without requiring them to scroll down the page first. 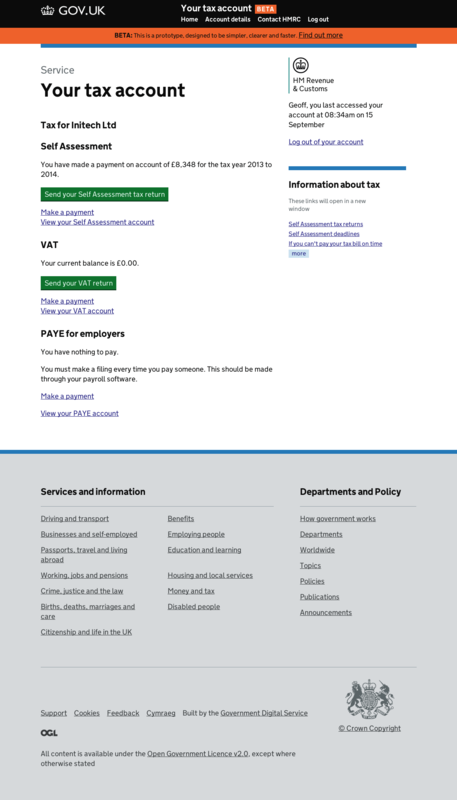 We've also again reduced the amount of information on display, so that the focus is on the current tax position and future action rather than history (although users can still access their history). This cleaner, clearer display has tested very well so far, but that doesn't mean our design work is done. We will continue to make changes and test them at regular user testing sessions and by putting them in front of customers in our private and public betas next year. If you run a small business and you'd like to volunteer to take part in our private beta, please register your interest with HMRC by 17 January 2014. Please note that we will ask you to give some basic information about your business which will help us to select a broad range of small and medium businesses to take part in the trial.